This week YouTube released a new version of their custom blurring function. 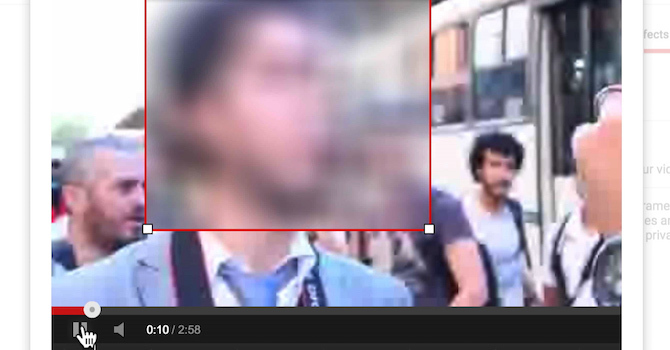 This feature allows users to blur select items in their videos such as faces or identifying information. In this post we will show you how to use the tool and give a brief background on why blurring can be important when sharing human rights video online. This is a big update to the tool and makes the ability to protect those you film significantly more accessible. For additional background, check out this blog post where we go into depth on the importance of visual anonymity and how expanding the access to tools that allow for it means that more people are empowered to speak out safely and effectively. The original function allowed you to turn on a facial detection feature that would blur all the faces it could find in the video. If it didn’t quite get all of them, or if you just wanted to blur one or a few of the people in the video, there wasn’t any way to adjust. But that has changed here. Now you can enable that ‘blur all faces’ option or you can choose specific regions to blur; draw a box around a license plate, for example, and the tool will follow it and keep it blurred throughout the video. It’s a robust tool, as it’s using the same underlying technology that Google uses to blur faces in Google Maps and Earth. When we first wrote about the YouTube tool in 2012, we talked about how much of a timesaver it would be. And that was true, even though a one-minute video full of faces took a half hour to process. But it’s exponentially faster today: going through a one-minute video with a single face, making sure to adjust as the subject turned her head and moved in and out of the frame, took just under ten minutes. Most of that was the time it took to watch the video and manually adjust the blurring region, with each adjustment necessitating just about two seconds of buffering. We put together a quick walkthrough video showing how to find and use the blurring tool. The first step is to find it, since it’s not front and center — you’ll find it in a sub-menu called ‘blurring effects’ that sits within the ‘enhancements’ menu, which you can find underneath the frame of a video you’ve uploaded or by going to the ‘info & settings’ tab within your video manager. Once you’re there, you can choose the ‘custom blurring’ option and draw a box over the face or region you are looking to protect. Note that the tool isn’t accessible on mobile, so even if you upload from your phone or another device you’ll need to get to a computer to use the blurring feature (or use an app like Obscuracam). As for how to use it, it’s a lot easier to show than tell, so check out the short video for a step-by-step explanation of how to blur a region and adjust as needed to make sure it’s covered throughout. That second step is an important one: the tool is good but not perfect, and it will often lose track of the object it’s tracking, especially if there is a lot of movement. You can watch the video in the blurring editor and make adjustments or extend the duration of the feature as you go. Once you’re done, you have a few options for saving. One allows you to save your changes so you can revert back later; another saves the blurred version as a copy, maintaining the original; and the most secure option saves the blurred version and deletes the original. The latter is preferable if you’re properly storing your material elsewhere; see our Activists’ Guide to Archiving Video for more. Visual media presents a lot of challenges when using it for human rights, but with greater awareness and user control through tools like YouTube’s new blurring update, more of us can take advantage of its power as a tool for making change. If you’re conducting a sensitive or high-risk interview, you’ll need to use an editing software to obscure the subject’s voice. And while your face is the easiest way to identify you, it’s not the only one; for example, Facebook can now identify you in a photo that doesn’t have your face in it, thanks to context clues like body type and clothing. Our tipsheet on concealing identity lists a few things to watch out for, including asking an interviewee to avoid talking about specific names or places. This video shows how to film an interview without revealing identity, instead of relying on editing it later. Some of these other filming approaches may come off as more powerful and humanizing than the blurring. If you’re using a mobile phone, the Obscuracam app we worked on with The Guardian Project is the only option out there, and it wipes metadata, as well, which can help protect you as the filmer. By thinking about privacy before you start filming, you can shoot strategically so blurring after the fact can be a last resort if needed. Having access to a tool for obscuring identity also doesn’t remove the need to think hard about the privacy, dignity, and agency of those you capture on camera. Our tipsheet on informed consent is one place to start and we also have a sample consent form here. Whether you are a reporter, social curator, or just a viewer, you may come across videos where identities should have been obscured but weren’t, and it’s important to think about privacy before you share on. For more on the dynamics of sharing, see our post about a video of the abuse of a young man persecuted on the basis of sexuality in Russia, which was widely shared and reported on without blurring the victim (or perpetrators) faces. See also our recently released Ethical Guidelines for Using Eyewitness Videos In Human Rights Reporting and Advocacy.